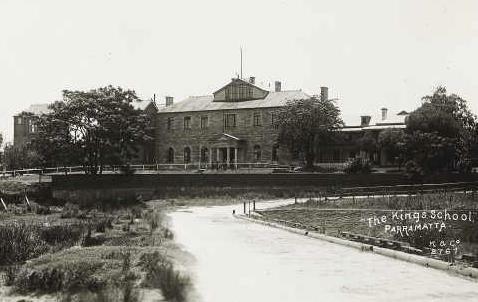 The old British Orphan’s Asylum (BOA) at Slough in Buckinghamshire offered free tuition and board to the children of ‘gentlemen’ where the father had died, leaving the family to suffer a declining standard of living. Children could only enter the school if they obtained sufficient ‘votes’ in an election campaign held amongst the financial supporters of the school. In far off Australia, the widow of Englishman Philip Boulton, a bank manager in Melbourne prior to his death in 1895, feared for the prospects of her two Australian-born sons. Government schools in Australia were deemed not good enough for her boys, and she was unable to afford private schooling. English relatives stepped in to help and evidently did a fine job promoting the Boulton boys' cause, because both were accepted into BOA, on the other side of the world. Still aged only ten, Master Nigel Boulton was one of the passengers for London when the R M S Australia sailed from Sydney on Saturday 9 September 1899. During his journey he wrote several letters home. 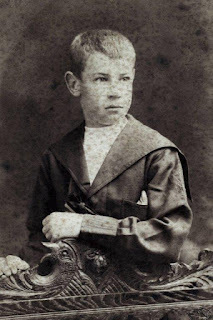 A year later, ten-year-old Master Stephen Boulton also set off alone on the long sea voyage to join his brother, leaving Sydney on 14 July 1900 aboard the P&O vessel Britannia. In both cases, a suitable person among the fellow passengers must have been charged with the responsibility for each boy's welfare. Their mother Dora, known as Dolly, was keen to get away and join her two boys in her native land. 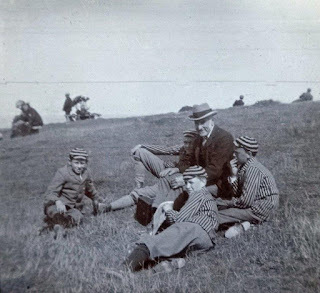 With her husband’s probate in England finally granted late in 1901, Dolly and her seven-year-old daughter Thea sailed for London on 24 June 1902 and enjoyed an 18-month stay in England as guests of various extended family members. 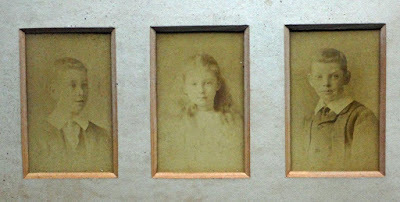 Photos of the three children were taken at this time. Since her own immediate family (her parents and her sisters) had made their home in Australia in the 1880s, Dolly returned to Sydney, departing Liverpool with Nigel and Thea aboard the Medic on 14 January 1904 and leaving Stephen behind at school in England. You see that I have got back to school from the holidays. I got back here on the 19th, John and Ken [Dixon, his second cousins] went back on the same day. I am now ninth top of the fifth, I was glad to hear that I was staying on till Midsummer. When Cousin Mary [his mother's cousin, mother of John & Ken Dixon] received that booklet of Flowers of Australia [painted by Margaret Flockton, Stephen's maternal 'Aunt Mog'], Maud and Bob were staying with her, and Maud was greatly overcome with them and the excellent painting she knew them all; Bob and her are both artists. Mr Gilliat told me that he had received one of them. Last Saturday he took us to a lake to skate, hardly any of us (the 5th form) could skate but we enjoyed ourselves very much in sliding. Tell Nigel that Mr Veerman has left, and that last term, the chaps contributed to give him some music. The new master is rather decent- I am his water-boy, his name is Mr Roberts. Also tell him that the prefects are Barker 1, Robinson 1, Wilson, Shibbs, Potter, Hoyles. While the other 5th Form boys do shorthand I have to teach some boys writing, who do not do shorthand. Last Wednesday we went to a lecture on New Zealand. There is no more news to tell you so I will have to say Good Bye hoping you are all quite well and sending much love and kisses to all especially my Bab-Child [his sister Thea] and her children [her dolls]. P.S. I shall see you all before this year is out. Imagine it!!! I put that 10/- which Aunt Julia [Julia Charles, his mother's paternal aunt] gave me in the Bank. 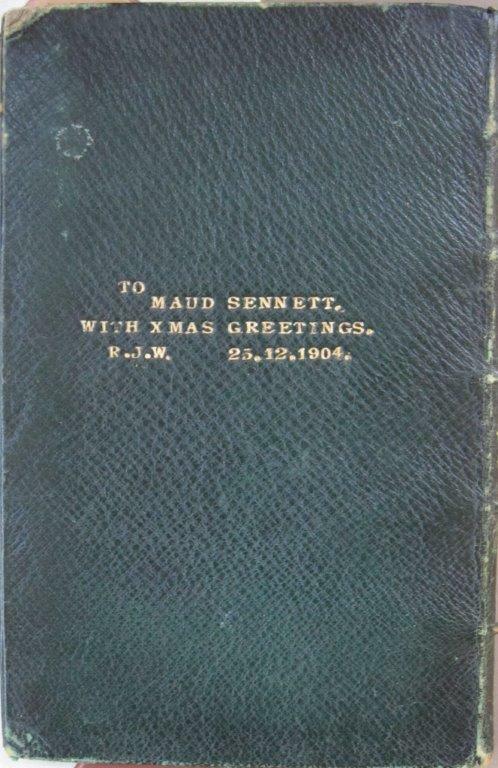 It's highly likely that Maud & Bob were the Sennetts, an interesting couple. Prior to her marriage to Henry Robert Sennett in London in 1898, the talented Maud had been a successful young Shakespearian actress with the stage name of Mary Kingsley. Roughly the same age as Margaret Flockton, Maud a.k.a. Mary Kingsley had toured Australia in the early 1890s and this would explain the familiarity with Australian wildflowers mentioned in Stephen's letter. He described Maud and her husband Bob as artists, but this must have been a recreational activity as they were running her family's ornamental confectionery company. 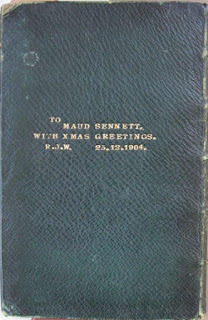 Australian women had the vote by the 1903 Federal elections and soon afterwards Maud became very active in the sufragette movement in England, leading to her arrest several times. An unknown R.J.W., perhaps a woman appreciative of Maud's efforts and knowing that she loved the wildflower paintings, presented Maud with a handsomely-bound copy of Margaret Flockton's wildflower booklet at the end of 1904. Family memorabilia includes a number of photos of Mr Gilliat in company with groups of boys like the Boultons, living too far from their families to return home for the long Midsummer holidays. I am sending you this little post card album for your birthday, I know it will be late but I hope you won’t mind that, I thought you would like it to put postcards in, I think I remember you having some. You are an awful pro winning first class honours at music, you are much better than me. Mother talks about me going in for the “matric” which will be impossible for me unless I can give up Latin, which I hate and am no good whatever at it, tell mother that Mr Hill can’t understand me not doing Latin when I do all the other subjects, he never makes me do any and knows I can’t do it, so he passes me over. Tell Mother when she writes next to tell me all [about] the house and what sort of a room I will sleep in etc. Thank you very much for the paper and little cutting. I sent the cutting on to Aunt Eleanor [his mother's paternal aunt Eleanor Flockton], she said when she wrote to me that she had only heard from you once since you left England. “Well played Toots he has actually passed in his exam what an awful fluke”. The reports came last Thursday so I am just writing you a short letter to break the news. The detail reports do not come till the end of March, so I will have to tell you what I passed or failed in, anyhow that does not matter much, so long as I have passed. I hope Thea will like the post-card album, I thought she might like to put her postcards in. It is awfully cold here now there has been a wind blowing for the last 3 days. I do not like the idea of going to King’s College when I get out there especially if I will have to do Latin every day, here I do not do hardly any, when I do do it, Mr Hill calls it my Latin (Boltonic Latin) and then passes on to the next chap. I think I have got a chance of going away with Mr Gilliat again at Midsummer, but I am not sure, the other day he said to me “we will have to pick some boys for next summer”. P.S. I did not take my own bike away with me at Mid-Summer, but each of us were provided with them by Mr Gilliat, they were fine ones. 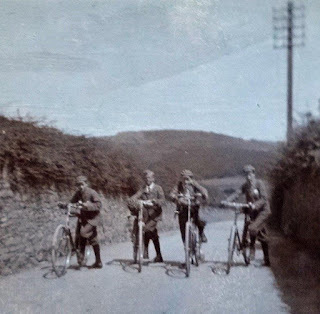 Four chaps failed in the exam. 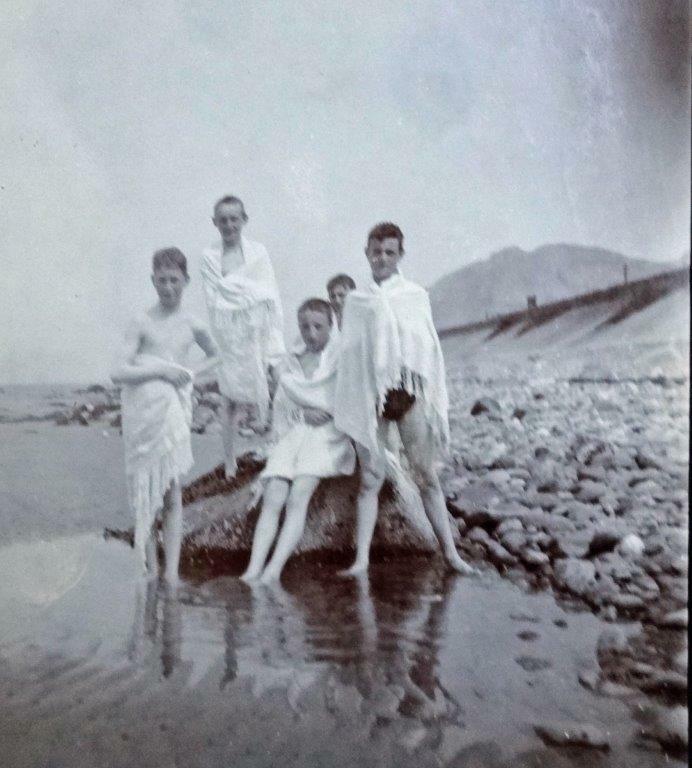 Stephen Boulton had dark hair and looks like the older and taller boy standing on the right of the seaside photo, presumably taken at Bournemouth not long before he left England. 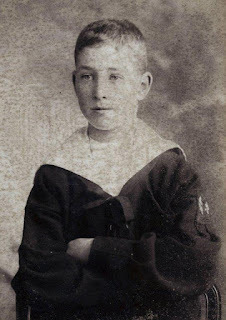 Fifteen-year-old Stephen travelled home alone, reaching Sydney aboard the Medic in late September 1905 before briefly joining his brother at The King’s School where Nigel had recently passed his matriculation exams. By the start of the 1906 academic year Nigel had left school and was enrolled in the Arts Faculty at Sydney University, planning ultimately to become a doctor. During 1906 Dolly purchased a property at Broughton Street, Concord. If the Boultons ever lived at Concord, it was not for long, as they soon joined forces with Dolly's botanical artist sister Margaret Flockton and their mother, forming a communal three-generation household in rental property at Gladesville for the next ten years. Trailing a year behind his brother at The King's School, there is evidence in 1910 of Stephen as an 'old boy' of the school but no record that he ever sat for his much-feared matriculation exams in 1906. Around the end of the 1906 academic year he went to work in the Pitt Street, Sydney branch of the Union Bank of Australia, his father's old employer. After seven years at the Union Bank, Stephen moved in early 1914 to the new government-owned Commonwealth Bank of Australia, around the corner in Martin Place. In his personal life, from 1911 for four tennis seasons he was an active doubles tennis player for the Hunter's Hill Tennis Club, working his way up into the A Grade competition by December 1914, the month before he enlisted for the Great War. NOTE: Other posts in this blog cover aspects of the lives of the Boulton brothers prior to their early teenage years. 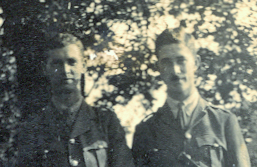 And for more details about their experiences during the Great War, see Brothers in Arms. Their aunt's life story is told in Margaret Flockton: A Fragrant Memory.